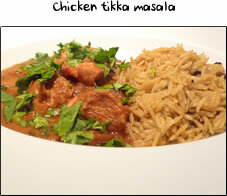 Ditch the takeaway menu and try your own curry for a change! 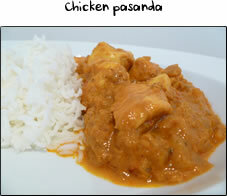 Homemade curries are so easy to make and taste fantastic... they're also far nicer than a jar. Chicken Korma is Britain's favourite curry (knocking Tikka Massala off the top spot) and one that everyone can enjoy because it's nice and mild. 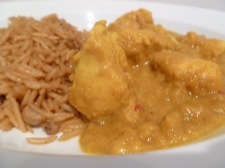 What a Korma lacks in heat it makes up for in creamy coconutty flavour. My version uses a little sugar for a hint of sweetness. This is a two part recipe. In part one we make the curry paste and in part two we cook the chicken and finish everything off. Before you start have all the ingredients chopped and ready. Boil the water, put your pan on a high heat and click here! Before you start have your food processor plugged in and click here! Put your pan/wok on a high heat and add a knob of butter and about a tablespoon of oil. Add in the chopped onions, garlic, ginger & chilli and stir to coat everything with the butter. Add in 1 tablespoon of turmeric, 2 teaspoons of ground cumin and 1 teaspoon of ground coriander. Stir well. Reduce the heat to medium and cook for 10 minutes, stirring occasionally to stop the mixture browning too much. Whilst this is on the hob, put 400ml of boiling water into the measuring jug and place the creamed coconut in the water. Leave the coconut to dissolve whilst the onions finish cooking. Empty the pan into your food processor and blend for 10 seconds. Scrape down the sides with your spatula, then blend again for 10 seconds until the mix has come together as in the second photo on the right. Empty the contents of your food processor back into the pan on a high heat. Add in a small handful of ground almonds along with a pinch of salt and pepper. Stir everything together then pour in the coconut milk from your jug and stir. Take the chicken chunks and add a good pinch of salt before putting them into the pan. Stir and bring to the boil before simmering for 25 minutes. 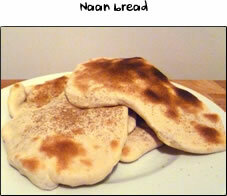 If you're having rice or naan bread then time that to also be ready in 25 minutes. After 25 minutes the sauce will have reduced and thickened slightly. All that's left to do is add in a teaspoon of sugar. Stir and serve with your favourite rice or naan bread.